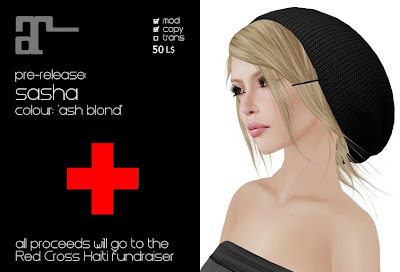 To help raise money for the Red Cross International Response Fund we have set up a special pre-release of our Sasha hair with colour-scripted hat. This pre-release is in ash blond and in bistre black and they are only 50L each. 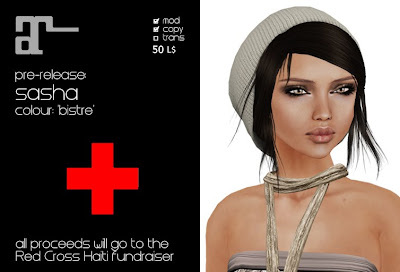 All proceeds will go the Red Cross Haiti Fund! At our main store you can find Sasha in ash blond and in bistre at the left side of the hair department entrance. And at Scribble you will not only find our Sasha pre-release, but also many other great donation items, by many sl creators.